GUEST BLOG / By Adam Lottes--There are those who say Escondido has no energy or atmosphere or even culture. However, they couldn’t be more wrong. I grew up in these gently rolling hills lined with endless Avocado groves. There is much to do in this “Hidden Valley”. There are many places to frequent that are just as unique as any other out there. One of my favorite places, one where I usually start my day is the family-owned and operated Suzy Q’s Diner. 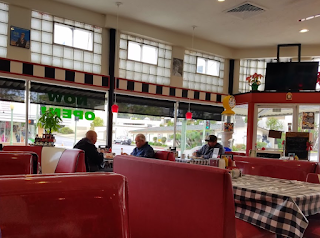 Themed after a Fifties diner, complete with a functioning jukebox and walls lined with pictures of some of the biggest names in the era such as James Dean, Elvis, and Marilyn Monroe. This corner Diner used to be home to a lounge that hosted poetry readings and later had a pool table. Today it is a bustling eatery that is a throwback to yesteryear. Not only is the place in full Fifties décor but so are the food portions. Each dish is prepared fresh when ordered. Suzy, the owner of the establishment, is also the head chef with a long resume with many years spent in the kitchen learning from culinary geniuses all over the world. My favorite dish is the “Patsy Kline” – corned beef hash, country potatoes and a side of wheat bread. The mix of spices in that dish overwhelms my palette every time! The staff is extremely friendly and always eager to please. On weekends count on a wait and then before you know it you’ll be devouring a delicious freshly made dish. Now that my appetite is sedated it is time to find something else to do in Escondido. I venture around the corner to Grand Avenue, which is lined with shops. 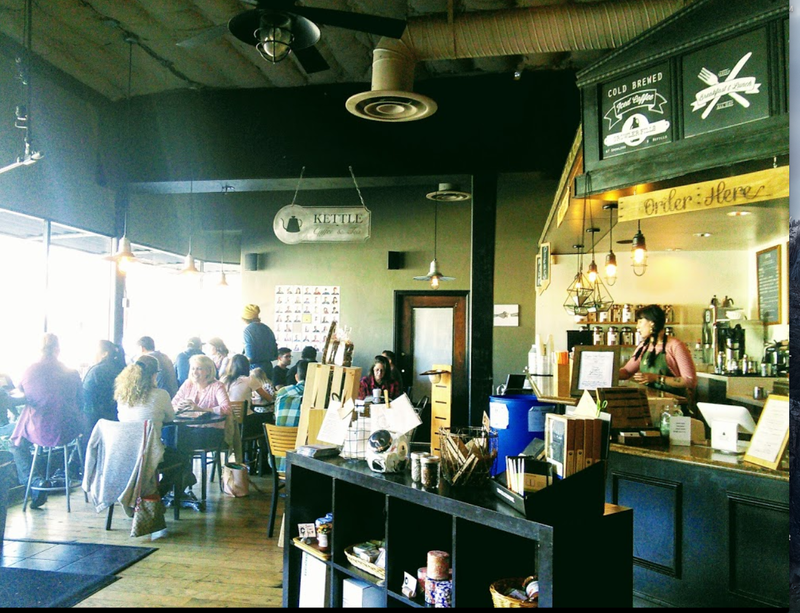 One of my favorite places to stop and take in the scene is Kettle Coffee and Tea. A quaint coffee house with brick lined walls it has the feel of a maker’s shop. Everyone knows I enjoy a cold brew and this coffee den serves up a fine one. I take it out front and have a seat in a green rocking chair. Sometimes I bring a book and other times I sit and rock and chat with the locals, who are mostly college students studying away. The looks they give me as I try to converse with them! I get a lot of eye rolls on those days, even my wit and charm can’t penetrate their focused minds. 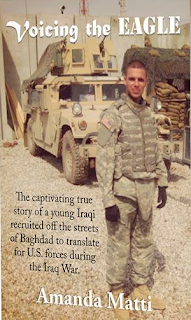 On this day I carry with me a copy of local author Amanda Matti’s newest book “Voicing The Eagle” – a true story about an Iraqi interpreter during war-time. I feel the need to stretch my legs and so I continue to wander on. 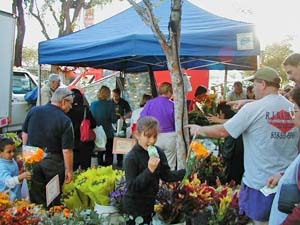 The Escondido Farmer’s Market is held on Tuesdays and is one of my favorite markets to attend. Always bustling with a great assortment of the freshest goods. One vendor has an endless supply of flowers. Flowers of every color and size. They sell out quickly, as does much of the veggies, nuts and fruits on these Tuesday markets. With the sun setting I feel it is time for a cold, refreshing glass of beer. 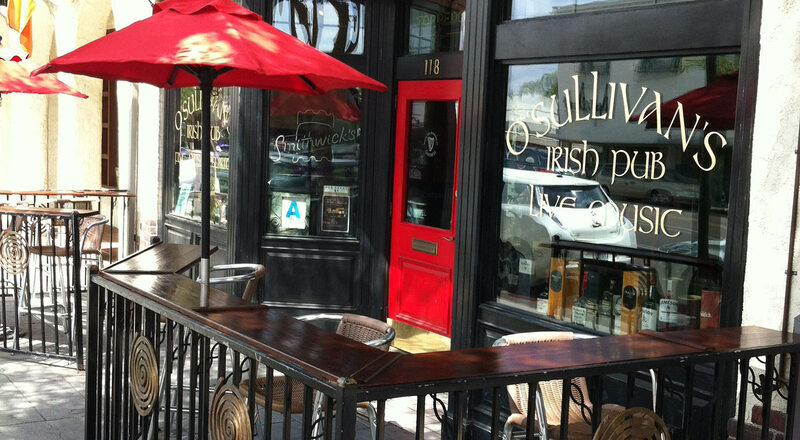 A stop at O’Sullivan’s Irish Pub seems like a fantastic way to end the day. Upon entering I find myself thrown into a world on the other side of the ocean. From what I have seen, read and heard this is exactly the cramped feeling one would get from an authentic Irish pub. Yes the quarters are close but so are the bonds formed by complete strangers in this green and brick themed watering hole. On Thursday nights there is karaoke from a selection of talent. Some are committed to developing a music career. Others recite poetry and some just crack tasteless jokes. That’s when it becomes time to order another pint. These karaoke nights are a highlight for the O’Sullivan’s crowd. Each performer has their groupies and fans cheering them on as they test out a new song. My day away from the work grind is winding down. It has been a day well spent in Escondido and I look forward to many more to come. There are many jewels to be found in this town. Antique shops, amazing hiking trails, cafes and eateries line not only Grand Avenue but also the other major thoroughfares in town. 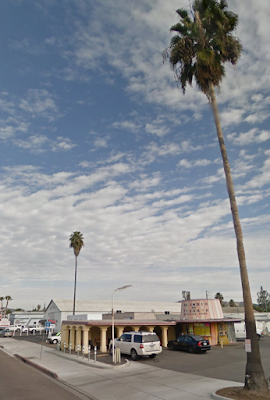 Perhaps next time I will make it to El India de Tijuana taco shop over on Mission Ave. It’s been in town for decades and boasts some mighty tasty tacos. The shop is hard to miss – shaped like a barrel and painted in yellow and orange. That adventure is for another day.